Dr. Thaker Mahmoud has received a certificate from the University of Essex. Dr. Thaker Mahmoud has received a certificate from the University of Essex. 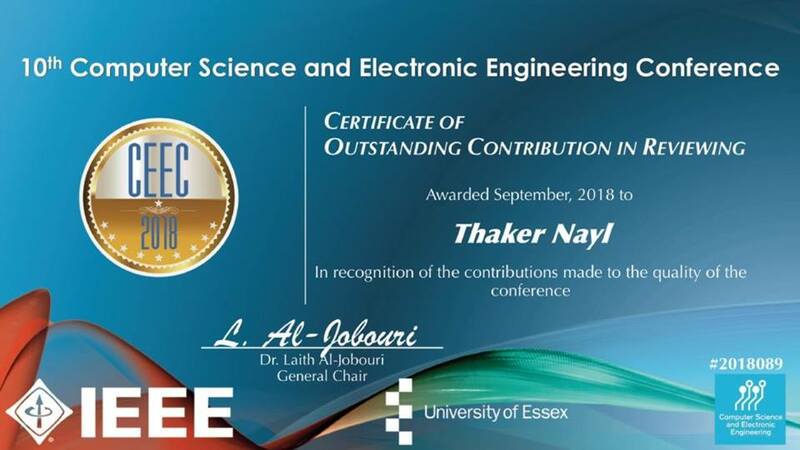 Dr. Thaker Mahmoud, Student Affairs Officer at the Faculty of Engineering, received the certificate of appreciation as a result of excellence by evaluating a number of scientific research for the conferences of the University of Essex. Dr. Thaker has been chosen for more than once as the arbitrator and evaluator of scientific research published by the British University at its annual conference held with the participation of IEEE (Computer Science and Electronic Engineering Conference).